The Seresto 8 Month Flea & Tick Prevention Collar for Cats & Kittens is designed with a unique delivery system that protects your furry friend from ticks and fleas. Seresto Flea Collar for Cats is veterinarian-recommended and formulated to treat and repel ticks and fleas on contact. It can be used on all breeds of cats that are at least 7 weeks of age. The Bayer Seresto Cat Collar contains a unique polymer matrix that is odorless, non-greasy, and easy-to-use. 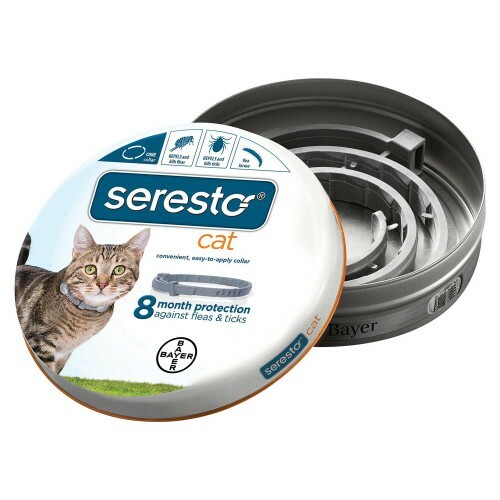 The active ingredients of the Seresto Flea and Tick Collar for Cats include flumethrin (to repel and kill ticks, larvae, and nymps) and imidacloprid to control flea infestations. This highly effective formula provides dual-action protection against disease carrying pests for up to 8 months.